Since announcing my training camp I have been busy tweaking its webpage, planning the schedule and pleasingly fielding emails either committing or enquiring further. Among those enquiries have been questions regarding the timing of the camp and how that would fit into a season planned around a summer Ironman. More simply: can a week of heavy training four or five months before a key race provide benefits? Yes, but then I would say that – I want a full camp. Putting my inevitable bias to one side I should give a more reasoned argument for the role of the early season camp in a training plan. A training camp, regardless of timing, is about improving fitness – or skills – relevant to triathlon. It does so by offering a supportive training environment, a challenging structure and the removal of all distractions. Each day you train longer and harder in the presence of your peers, subtly, or not so subtly, pushing each other on, and then you recover, properly recover, free of the demands of work or family. Increased load balanced by increased recovery. While we normally look for consistency and a steady, manageable progression, the camp is about a jump in fitness. The real issue is what place a spike in fitness has back in February. During a build or peak period a camp can put the finishing touches to your preparation; you should already be in excellent shape and able to take full advantage of the camp to push yourself further. 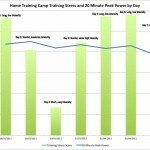 It is easy to connect the performance in a race with the activity of a peak period training camp. Harder though is to see how a big week of training in February is of benefit when three to four months of progressive training still follows. But I would argue additional gains in fitness are always beneficial, the fitter you are the more work you can do to improve performance. 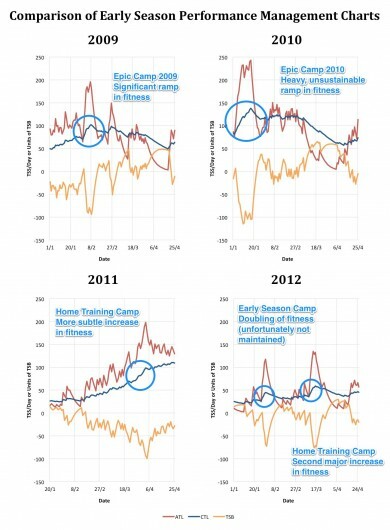 The samples of my Performance Management Chart (PMC) above show the first four months of the last four years each containing at least one training camp. The blue line, labelled CTL, represents fitness, its profile a reflection of my training. For the purposes of this blog we can view the PMC simply as a visualisation of the training process, understanding that effective training raises the blue line. The more I do the steeper it climbs, the higher it rises the fitter I am. It would be inaccurate to label this period of 2009 or 2010 early season, my schedule was ongoing and the two Epic Camps are more akin to a mid-season camp. I am already in good general fitness (the blue CTL line is high), I can perform well on the camp and use it to achieve higher than normal levels of fitness prior to a race. They are perfect examples of the peak period training camp, the fitness boost of Epic Camp 2010 led to one of my most successful Ironman races in New Zealand. By 2011 I had settled back in the Northern Hemisphere and into a seasonal cycle. I start the year from lower fitness and use the training camps to accelerate my fitness growth (a short, sharp climb in CTL). In 2011 a week focussed on volume towards the end of March set me up for a summer of hard riding. The content of that week had little direct input on my race performances, but it gave me the fitness to focus more effort into developing power. 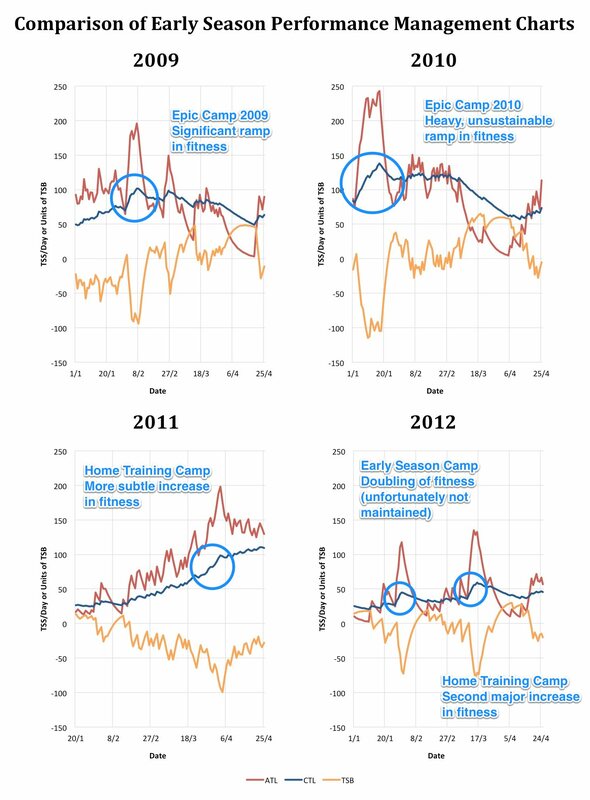 2012 is the counter example, showing two failed attempts to use an early season camp, each fitness boost rapidly lost without the support of consistent training. Unsurprisingly I was ill prepared to race. An athlete needs sufficient fitness to deliver a race performance and the early season camp offers a means of accelerating towards that goal. Not towards peak fitness, but towards the platform on which peak fitness and performance can be built. But it is a blunt tool and incorrectly managed it can be disruptive, interrupting the benefits of consistent progression rather than enhancing them. The balance of work and recovery needs to be managed to avoid burnout and enable the athlete to continue development after the camp. As my 2012 graph shows one week of improvements followed by three weeks of recovery is a disaster. Assuming an athlete is in reasonable fitness with a period of training under their belt and they are cautious in how much additional training they take on during the week an early season camp can be very beneficial. And when we’ve been locked away indoors on turbos and treadmills what could be better than riding in the sun?